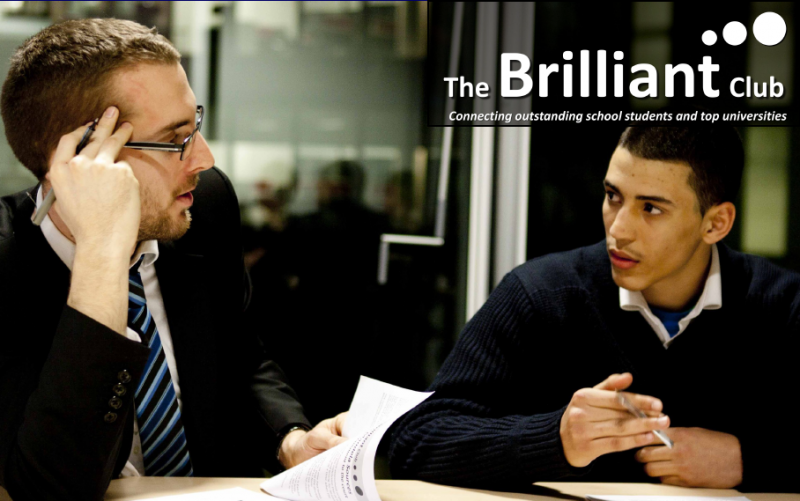 The Brilliant Club is a non-profit organisation focussing that exists to widen access to top universities for outstanding pupils from non-selective state schools. The primary activity is to recruit, train and place doctoral and post-doctoral researchers in non-selective schools and colleges to deliver programmes of university-style tutorials to small groups of outstanding pupils with the aim to develop the knowledge, skills and ambition of these pupils and secure places at top universities. The organisation’s primary activity is to recruit, train and place doctoral and postdoctoral researchers in non-selective state schools and sixth form colleges serving low participation communities to deliver programmes of university-style tutorials to small groups of outstanding pupils, which develop the knowledge, skills and ambition that help those pupils to secure places at top universities. 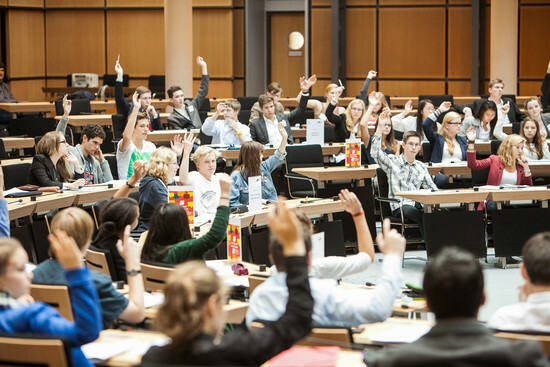 The overall vision of the organisation is one that sees an education system in which young people from non-selective state schools and other low participation backgrounds are proportionately represented at highly selective universities. The organisation’s mission is to widen access to highly selective universities by placing PhD students in schools serving low participation communities to deliver university style teaching to high performing pupils. In terms of scope, the organisation is working together with schools, colleges and universities, the Brilliant Club is building a national movement that mobilises doctoral and postdoctoral researchers to engage with challenging schools and to address educational disadvantage more broadly. Doctoral and postdoctoral researchers are placed in schools to deliver programmes from Year 6 through to Year 12. The Brilliant Club are currently working with over 150 schools and colleges in London, the South East and the Midlands, placing over 250 doctoral and postdoctoral researchers to work with more than 5000 pupils. The initial idea for The Brilliant Club came from two classroom teachers, Jonathan Sobczyk and Simon Coyle. After a research and consultation phase that included teachers, academics and policymakers, they designed and delivered a series of successful pilot projects. The organisation was founded in 2011 with support from the Sutton Trust, Teach First and Challenge Partners. Just 2% of pupils eligible for free school meals (FSM) and 18% of pupils attending non selective state schools go on to study at a highly selective university, compared with 48% of pupils attending fee- paying private schools. In addition, when pupils from disadvantaged backgrounds demonstrate the potential to secure a place at a highly-selective university, they often require a range of on-going support mechanisms to make this outcome a reality. As a group, these pupils are much less likely to achieve the grades necessary to make a competitive application to highly selective universities. They are also less likely to have developed the skills that are prized by those universities, less likely to receive effective information, advice and guidance about higher education and, as a result, can sometimes lack the confidence and conviction that a highly selective university is an appropriate choice for them. School leavers are 20% more likely to progress to higher education today than in the mid-1990s but, despite an overall increase in the number of pupils from low-income backgrounds progressing to university, this growth has lagged behind that of their wealthier counterparts in recent years. Two thirds of pupils who are in receipt of free school meals and who are amongst the top fifth of performers at age 11 are no longer in the top fifth by the time they sit their GCSEs, and half do not progress to higher education. 80% of young people from low participation neighbourhoods live in close proximity to a highly selective university but only 1 in 25 will go on to attend such a university, compared with 1 in 4 from high participation neighbourhoods. These figures demonstrate the inequality of access to higher education within the UK education system today. Although disparity exists across all universities, the problem is most acute at the thirty most selective universities. This is the gap that the initiative seeks to address and the context within which it works. It only focuses on non-selective state schools. Requires an absolute minimum of 1 in 4 pupils on the programme who must be eligible for free school meals. Targets and prioritises schools in areas of significant social deprivation. More than 90% of schools sampled have above average pupil eligibility for FSM. The project is in line with the More Able agenda and the schools fund the programme normally through the Pupil Premium funding. Our programme only costs approximately a quarter of the funding that is allocated to each pupil. To ensure the highest quality of pupil learning and researcher development, the Brilliant Club works with several national leaders in Education, Teaching Schools and schools that have been rated ‘Outstanding’ by OFSTED. In total, they are currently working in partnership with over 150 primary and secondary schools and school leaders as well as the universities of Oxford, Warwick, Sussex, Royal Holloway and King’s College London. Whilst the recruitment and training is more structured for researchers from partner universities, they have nonetheless employed PhD tutors from over 20 universities this year. They also work closely with the founding partners, The Sutton Trust and Teach First, and strategic partners such as Challenge Partners, Goldman Sachs, The Dulverton Trust and The Brightside Trust. We believe there is broad public support for the programme nationally and locally but the programme has not fully exploited PR opportunities. A core focus on academic development: tutorials develop critical thinking and communication skills, as well as building confidence. Between tutorials pupils undertake challenging reading and writing assignments, which lead to the completion of an extended final assignment, developing effective research skills, academic writing skills and independent learning. Targeted intervention: work is done with schools to ensure that all pupils who take part in our programmes have demonstrated the potential to secure a place at a highly selective university and/or will gain significant benefit that would not otherwise have been available. Early and sustained intervention: organisation staff work with pupils at a young age and continue to support their academic development throughout their school careers, giving opportunities for new pupils to join our programmes at each Key Stage. Age-appropriate support: the programmes combine academic development with information, advice and guidance relevant to subject and university choices, along with a variety of aspiration-raising activities including trips to highly selective universities. The Scholars Programme is designed to emulate teaching and learning at a highly selective university. They recruit, train and place PhD students and postdoctoral researchers in schools to deliver programmes of university-style tutorials that develop knowledge, skills and ambition. The length of tutorials and the size of groups vary depending on the Key Stage, but never exceed a maximum of six pupils. Programmes begin with a Launch Trip at one of the partner universities, where pupils meet their PhD tutor and take part in a carousel of learning activities, including the first tutorial. For the next four weeks PhD tutors will spend half a day a week in school delivering two tutorials each time. Pupils are required to undertake weekly reading and writing assignments that lead to the completion of an extended assignment which the PhD tutors then mark thoroughly. The programme finishes with another university trip, where pupils are given a tour of the campus, meet with outreach staff, receive feedback on their assignments and then attend a graduation ceremony. The Brilliant Club is a registered charity and a non-profit organisation. They operate a sustainable model that ensures the long-term viability of the organisation and do ask schools to contribute to the cost, minimised through subsidies from fundraising activities, and never more than £160 per pupil. They employ PhD tutors on a part-time basis and pay them competitively for each programme that they deliver, typically £450 per placement for approximately 6 full days of work over a term with an additional allowance for travel and expenses. To support these PhD tutor costs, and the costs associated with planning and delivering university trips, they ask that the universities they have a formal partnership with to contribute financially over the long-term. They do not ask universities for financial support upfront, and always prefer to run a pilot partnership programme to see if the outcomes are mutually beneficial to all parties before discussing longer-term partnerships. The Brilliant Club facilitates sustained contact between outstanding pupils and doctoral and postdoctoral researchers from top universities. 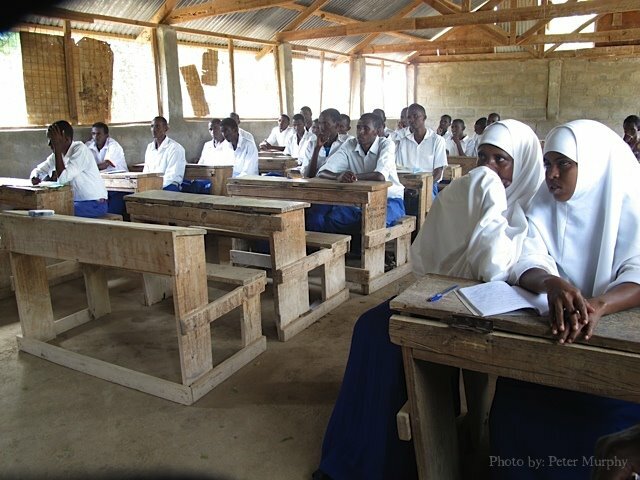 In doing so, they offer a simple and scalable solution that addresses the inter-related problems that affect access to education and at the same time benefits each of the key stakeholders. Pupils develop the skills, confidence and ambition that help them to secure places at top universities; schools develop a culture that champions excellence, hard work and progression to higher education; doctoral and postdoctoral researchers are paid for taking part in high quality development opportunities; and universities are given access to target schools and target students. We are sustainable except for that we are growing at present. 15% of our funding comes from grant support 25% of our funding comes from universities and the rest from schools. We are given support and resources in kind from universities such as student ambassadors to guide students around the university and venues for launch and graduations events. Evidence of success can be seen in various ways: endorsements and awards received; growing partnerships and interest in being a Brilliant Club tutor as well as data on improvement of grades and access to highly selective universities, all described below. The organisation’s programmes have received accolades and endorsements from pupils, PhD tutors, teachers and academics, as well as policymakers such as the Secretary of State for Education and the former Shadow Secretary of State for Education. The programmes appear to have been increasingly successful: within six months of their development, the organisation had completed pilot programmes with year 9 and year 11 pupils at a North London school, as well as with year 12 participants on the Higher Education Access Programme for Schools (HEAPS). In each case they received excellent results and feedback: over the course of the year 11 programme, the number of pupils working towards 5 A*-A grades increased from 3/19 at the start to 12/19 at the end, with 15/19 going on to achieve at least 5 A*-As in their GCSE results. From their first pilot group of 12 pupils who applied to university in in 2012, eight were offered places at highly-selective universities and two were offered places at Oxbridge. Following from the success of the pilots, the organisation had significant interest from many schools, including some of the most innovative and outstanding state schools in the country, and they ended up placing 54 PhD students into 35 schools between September 2011 and July 2012. Between September 2012 and July 2013 activities were expanded significantly, working with over 100 schools in London the South East and the Midlands, and placed over 150 PhD students to work with over 3000 school pupils. Since the pilot phase, the work is having a significant impact on students in London; however, they intend to work with schools and universities across the country to build a high-profile national movement committed to widening access to top universities. The most significant achievement to date is that they have worked in partnership with 150 schools and six of the country’s most selective universities to establish the organisation’s innovative model of recruiting, training and placing doctoral and postdoctoral researchers to deliver programmes of university-style learning. In so doing, they feel they have laid the foundations for a widening access initiative which could one day be capable of bringing about systemic change. However, there is still a substantial amount of work to do to break the link between parental income and educational success and it will only be achieved in collaboration with schools, universities and partners across the education system. Though the scale of the challenge is great, initial indicators are very encouraging. 55% of pupils produced assignments considered to be excellent or good for a pupil one key stage above them. The following tables show the rates of progression to university for the first cohort of Key Stage 5 pupils. From a sample size of 62 pupils, representing 67.3% of the cohort, they have tracked the number of pupils applying to, receiving offers from and ultimately progressing to highly selective universities. The analysis is categorised by sub-groups, including pupils eligible for free school meals, pupils achieving 5A*-A grades at GCSE and pupils achieving AAB at A-Level. In order to help the organisation understand the impact of their programmes, they also survey all pupils by asking them to respond to statements about their skills, confidence and ambition. At the beginning of each programme they take a baseline of pupil perceptions by asking them to respond to a series of statements using a five point Likert scale ranging from ‘strongly disagree’ (1) to ‘strongly agree’ (5). When pupils graduate from the programme they are asked to respond to the same statements again, measuring any changes in their perceptions. In addition to this, they also ask pupils to respond to a series of five ‘one-off’ questions about their participation in the programme overall. There has been significant interest in working as a Brilliant Club tutor, reflected in the fact that the initial recruitment efforts attracted three applications for every place. This has allowed the organisation to select the very best to work as tutors, and are committed to maintaining this high standard for the PhD students. To support this aim, a rigorous assessment process has been put in place that requires candidates to demonstrate a high level of suitability and skills. The Brilliant Club has recognised that it is having an impact beyond the immediate target group of students. For example they believe the programme positively impacts on parents, siblings and the wider community. In order to improve their understanding of this have recently employed a Community Impact Director. One of the unintended impacts that has been identified is the impact on PhD students who find the programme a valuable networking opportunity and career development opportunity. There are case studies available showing how PhD value the programme in a particularly socially isolated period of study. First piloted in 2011 (when the organisation was set up) and ongoing ever since.